It’s been more than two years since Hurricane Katrina ravaged New Orleans with high winds and rain that breached levees and flooded the city in what has been described by the American Society of Civil Engineers as the worst engineering disaster in U.S. history. The center of Katrina passed east of New Orleans on Aug. 29, 2005, with high winds blowing out most windows on the Hyatt Regency New Orleans hotel’s north side and causing extensive window damage in other buildings, according to Wikipedia, The Free Encyclopedia. Within two days, approximately 80 percent of New Orleans was flooded – some parts under 15 feet of water, reports the encyclopedia. While New Orleans residents and businesses have made great strides in rebuilding the city to regain its much-needed tourist trade, many storefronts remain covered with plywood. That’s why members and business partners of the Specialty Graphic Imaging Association (SGIA) have volunteered to provide large-format graphics for unused storefronts on Canal Street, one of the most heavily trafficked streets in New Orleans that connects the Ernest N. Morial Convention Center with the historic French Quarter. 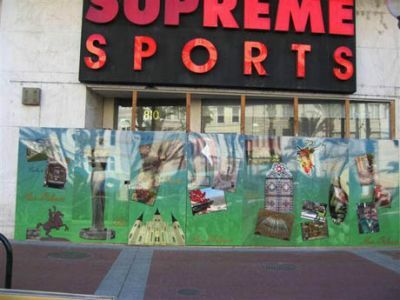 In late 2007, the colorful graphics – depicting the food, music, architecture and culture of New Orleans – began to replace plywood covering storefront windows on Canal Street. This project includes more than 80 4-by-8 foot panels and two super-graphic products. 3A Composites USA, an SGIA member, has donated approximately 100 sheets of the company’s Dibond® graphic display board to the Canal Street initiative – including 4-by-8 sheets and 5-by-10 sheets of white Dibond in the 3mm thickness and 4-by-8 sheets of Dibond Brushed Silver in the 3mm thickness. Dibond, the Ultimate Substrate, is a rigid, durable aluminum composite material consisting of two pre-painted sheets of .012-inch aluminum bonded to a solid polyethylene core – a unique composition that makes it approximately one-half the weight of aluminum. Dibond, the flattest panel on the market, offers a superior surface for displaying digital and screen-printed graphics. Dibond won’t bow or oil can. And, Dibond products offer significant cost savings, ease of fabrication and rigidity when compared to other aluminum laminates. Dibond is available in 13 standard colors, including five metallic shades. All Dibond products can be incorporated into both interior and exterior displays and offer excellent outdoor durability. They’re perfect for creating signage, exhibits and displays. Dibond’s outdoor durability made it the perfect choice for the Canal Street project from 3A Composites’ extensive line of graphic display boards, according to Andrea Jimenez, marketing manager, 3A Composites USA. Max Hoyt, chief visionary, PIXUS Digital Printing, also was eager to contribute digital printing services to the Canal Street initiative when approached by SGIA. He opened his business in 1992 in Lafayette, La., a mere two-hour drive from New Orleans. 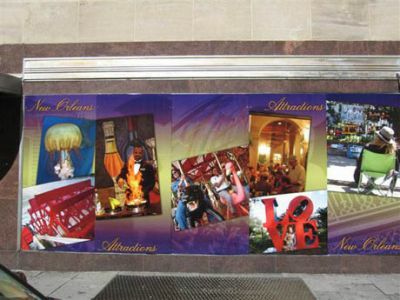 PIXUS employees utilized a Gandinnovations Jeti 3150 UV True Flatbed to direct print Dibond Brushed Silver graphic display board with images of jazz music, gas street lights and wrought iron fences that were created and donated by local New Orleans’ artists. In order to protect the graphics from graffiti, PIXUS finished the panels with 3M Scotchcal Matte Overlaminate 3545. PIXUS printed 13 4-by-8 panels that currently are installed, with the Dibond Brushed Silver visible on the edges. Ann Brown and her husband Gordon Brown are co-founders of Golden, Colo.-based New Vista Image, which produces graphics for interior and exterior décor for architects and museums. As 25-year-plus members of SGIA, the Browns were eager to support the Canal Street project. New Vista Image employees utilized an HP Scitex XL1500 Printer (3-meter width) and solvent-based inks to digitally print the New Orleans culture-inspired graphics on 3M Controltac Plus Graphic Film with Comply Performance 180C-10, which was laminated with 3M Scotchgard Graphic and Surface Protection Film 8991 to resist graffiti. The printed and laminated graphics then were mounted to 4-by-8 sheets of white Dibond graphic display board through a heat-transfer process. 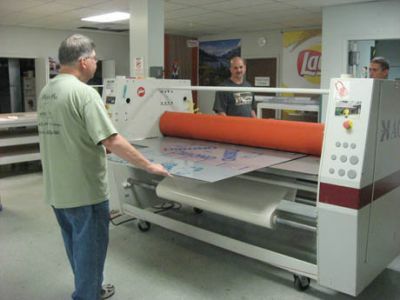 Both Hoyt and Brown credit advances in digital-print technology to their companies’ abilities to cost-effectively print small runs of large-format graphics. “There weren’t many ways to print directly onto materials like Dibond until the last several years,” said Hoyt. For more information about PIXUS Digital Printing, visit www.pixus.com or call (337) 234-0706. For more information about New Vista Image, visit www.newvistaimage.com or call (303) 216-1549. To view additional images of the SGIA Canal Street initiative, visit www.sgia.org.